PanARMENIAN.Net - A meeting of the Supreme Eurasian Economic Council started in St. Petersburg on Thursday, December 6, with heads of member countries of the Eurasian Economic Union (EAEU) in attendance. 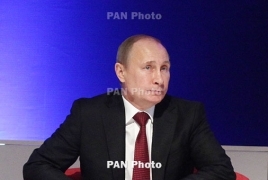 The meeting was opened by Russian President Vladimir Putin, who said that the EAEU presidency passes to Armenia. "Next year Armenia will take over the chairmanship of the EAEU. I would like to wish our Armenian colleagues success,” said Putin, who gave the floor to the acting Armenian Prime Minister Nikol Pashinyan. Pashinyan said, meanwhile, that Armenia is ready to take over the baton in the EAEU. The acting PM weighed in on the growth in commodity trade between the countries, cited Armenia's full support for the Union’s digital policy, at the same time detailing the upcoming early parliamentary elections in the country. President of Belarus Alexander Lukashenko, Kazakhstan's Nursultan Nazarbayev and Kyrgyzstan's Sooronbay Jeenbekov also delivered remarks at the meeting.